The rest of human history begins now, as Netflix has released the first trailer for their upcoming Lost in Space reboot series. This reboot has been gestating for a long time but finally found a home on the world's largest streaming service in 2016. Now, we have our first look at the dramatic and modern reimagining of the classic 1960's science fiction series, in addition to a release date, which is coming up fast, as Netflix is releasing the series on April 13. As for the footage, this is very much a teaser and doesn't reveal too much. We see the Robinson family walking slowly toward the ship that will send them on a journey to try and find a new planet for humans to colonize, as Earth is becoming unstable and won't be able to inhabit life for much longer. At the very end of the Lost in Space teaser, something goes wrong and it looks like their mission is going to be off to a rocky start. We then get the classic, "Danger, Will Robinson" line to wrap the whole thing up. Here's the official synopsis for the new Lost in Space series. "Set 30 years in the future, colonization in space is now a reality, and the Robinson family is among those tested and selected to make a new life for themselves in a better world. But when the new colonists find themselves abruptly torn off course en route to their new home they must forge new alliances and work together to survive in a dangerous alien environment, light-years from their original destination. Stranded along with the Robinsons are two outsiders who find themselves thrown together by circumstance and a mutual knack for deception. The unsettlingly charismatic Dr. Smith (Parker Posey) is a master manipulator with an inscrutable end game. And the roguish, but inadvertently charming Don West (Ignacio Serricchio) is a highly-skilled, blue collar contractor, who had no intention of joining the colony, let alone crash landing on a lost planet." 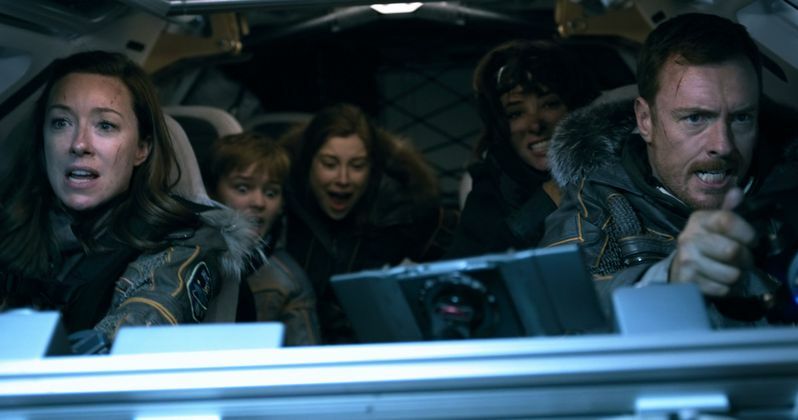 Lost in Space is making its way to us Earthlings in a little less than two months, but the first episode of the reboot has already made its debut in space. This teaser serves as the first look at Netflix's reboot on Earth, but Lost in Space was made available for viewing in space recently, with Netflix having provided NASA with access to the pilot episode, which was transmitted 12 days ago to the International Space Station for astronauts to view during their leisure time. CBS aired the original Lost in Space series, which ran for three seasons and a total of 83 episodes from 1965 to 1968. There was also a live-action movie released in 1998, but critics and fans don't generally hold it in high regard, to say the least. Can this new Lost in Space series, which is giving off some serious Interstellar vibes, provide a worthy modern take on the classic show? We'll find out come April 13. For now, be sure to check out the first teaser trailer for the Lost in Space reboot, courtesy of Netflix, for yourself below.